Yushchenko paid to Ekhanurov and paid debt to Ogryzko? Parliament member, member of the BYUT faction Andriy Shevchenko names unexpected the submission of President of Ukraine Victor Yushchenko on appointing Yuri Ekhanurov and Volodymyr Ogryzko for posts of the Defence Minister and Foreign Minister. He expressed such persuasion in the exclusive comment to UNIAN. “I think that by the proposition of the candidacy of Y. Ekhanurov the President wanted to say that his person will be in the Defence Minister, who is loyal to him and devoted personally to him. Also I think that it is a pay for Yuri Ivanovych for many years personal devotion to President”, said A. Shevchenko. 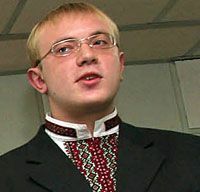 The parliament member could not concrete whether this position of the President came from the wishes of the Defence Minister in the previous structure Anatoliy Hrytsenko. “Now there is an issue concerning the future perspective of A. Hrytsenko. It would be interesting for me to hear: it was his wish for benefit of the work in the parliament or the President has changed the view concerning the future fortune of A. Hrytsenko”, he explained. At the same time A. Shevchenko noted the many year experience of V. Ogryzko, whose candidacy is proposed for the post of the Foreign Minister. “I think that the President paid the debt to V. Ogryzko, who he changed for Arseniy Yatsenyuk last year”, added the parliament member. “This decision of the President became unexpected not only for the parliament, but I think for all country, because other candidacies were named for this post. But I think these are professional people. I am sure they can be effective ministers. It is exactly the thing which the whole country and our political force wait from them”, underlined the BYUT representative.